Simon Says Pick your Favorite Technique! The Monday Challenge at Simon Says Stamp is to use your favourite technique. I have several techniques on my Favourites list but one of the techniques that I have been using a lot lately is to use Pico Embellisher (Shimmer) to emphasize elements of a card. On my entry for the challenge, I decided to use both the Clear and the Shimmer Embellishers to turn the childrens’ raincoats into “Rain Slickers”. The Pico Embellisher is thinner than Glossy Accents so it flows out of the precision bottle much easier. So I have to tell you that Sandra told me that it looks like these children are being mean to their stuffed bear friend by holding him by his ears! 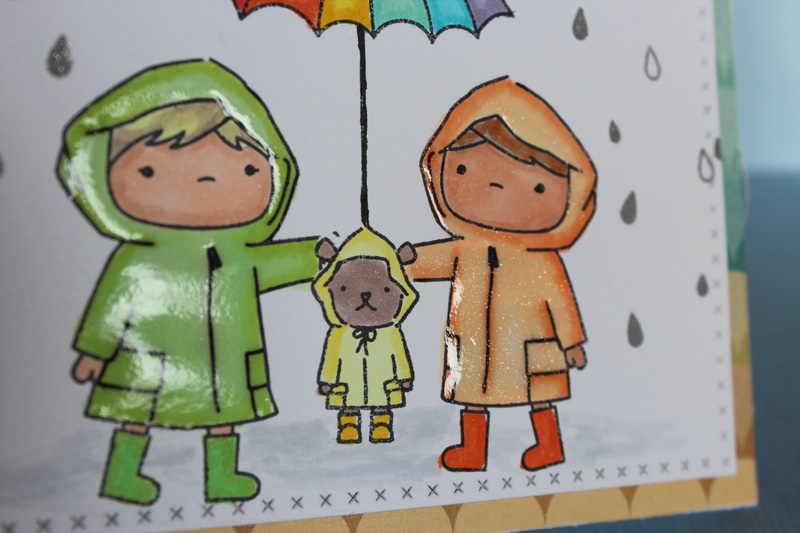 In actual fact they are very considerate children, holding the umbrella over the little bear’s head while enduring some of the raindrops themselves. I don’t want anyone to think that these children would do anything bad, when it is purely poor placement by the card creator. I was happy that the second picture was able to capture the “glare” of the raincoats and even the shimmer in the peach coloured one if you zoom in on the picture. Supplies: Mama Elephant Chance of Rain stamp set, Memory Box Cross Stitched Frame Border die, Studio Calico Print Shop patterned paper, Copic markers, Memento Tuxedo Black ink, Creatology Fun Foam, Recollections card base and scor tape. 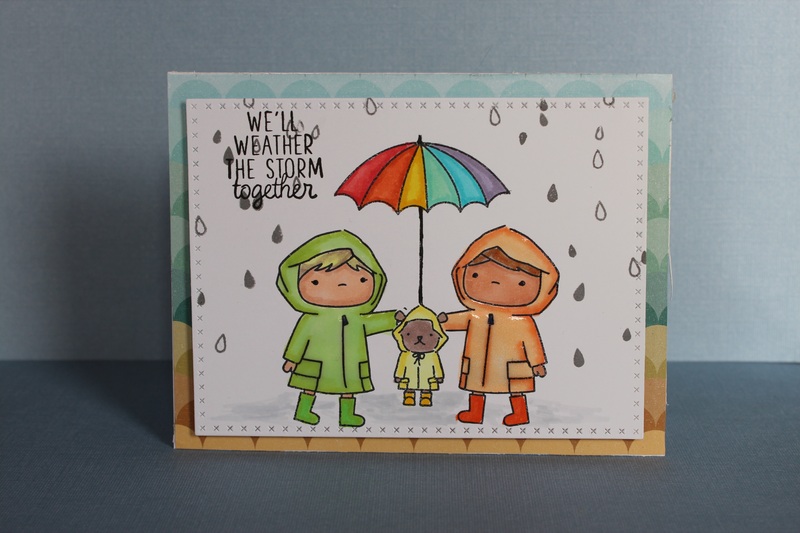 Posted on September 16, 2015, in Card Samples, Debbie's Challenge Entries, Oscar's (Deb's) Card Samples and tagged Copics, Mama Elephant, Simon Says Stamp. Bookmark the permalink. 2 Comments. Love the look of this card.